We are a full-service design shop. We’re here when you need us. We work the way you want to work. Simply submit your project idea, and we’ll get back to you asap. You’ll connect with our creative director, Jay Drury, an outdoor enthusiast, dog-loving, trucker-hat-wearing talent with more than 12 years of creative experience in designing and managing brands. You’ll be able to collaborate organically and be creative together. Whether you need us to do the whole thing or just to coordinate with your in-house team, you’ll quickly see how you can trust our work and get exceptional personal service. You tell us your design needs and we deliver on spec. You give us the target, and we’ll put together a visual plan and all the components to hit it. We can help increase efficiency and empower your in-house team with easy-to-use templates that are on-brand and impactful. We work together on creating a strategic plan for your brand growth and identity to create the emotive response you need to engage and secure clients. We have the style guide tools and advice to help you coordinate all aspects of your brand day-to-day. “The Style Guide is our quick cheat-sheet. We use it constantly whether creating something in-house or when coordinating multiple vendors for a large event or campaign. It keeps us on-brand with all of our fonts, colors, and styles listed out in all the formats that vendors ask for. It also includes a great set of samples for “Dos & Don’ts” on logo usage. I send it out to each of our vendors, so they’ve got everything they need in one place. And whether it is stitched on a bag, placed in a banner ad, or put on a billboard — our brand stays consistent." - Ross & Co LLC. We offer full-service brand management. We work with you and your team to complement existing in-house creative or be the go-to for all of your creative needs! We like to think of ourselves as part of your extended family. Reliable, tangible and undeniable — print. This medium has always been a favorite of marketing organizations. We get your trade show, pull-up banner or direct mail piece out the door to spec, on time and budget. Yeah, you could say printers like us :D.
"I have had the privilege of working with Jason (Owner) on a variety of projects. He is an exceptionally gifted art director who is easy to work with, conscientious and diligent. A consummate professional, he is someone who can deliver outstanding work under tight deadline pressure." way for viewers to digest your message. We can create a visual narrative that will transform your metrics into snackable content. "DC&Co has been a go-to asset for the design and creative needs here at Perfecto. Their ability to work quickly while providing the consistent quality we demand, doing so under often sensitive time requirements is huge. Their professional demeanor makes it easy to work and iterate through even the most challenging projects. They have a great sense of design and are able to stay on brand which helps us keep developing graphical content to deliver across the web, print, and large displays.  I highly recommend DC&Co to any organization that is looking for quality and friendly service-oriented experience."